We expressed our gratitude and appreciation to all the amazing women that have left and will continue to leave a footprint in our world: the women of past proud, the women of now inspired, and the women of the future envisioned. On March 8th, alumni, professors, students and friends of IE came to our campus to celebrate women who make a difference, and to take everyone on a journey that represented an extraordinary opportunity to highlight and showcase the accomplished and talented female members of our IE Family. Santiago Íñiguez, Executive President of IE University, and Celia de Anca, Director of IE Center for Diversity, opened the event with the recognition of women at IE. The round table ‘Shaping the future of IE’s Five Schools’, moderated by Yolanda Regodón, Associate Director of Communications at IE Business School, showed how women faculty are shaping our five schools: Teresa Ramos (HST), Waya Quiviger (IR), Martha Thorne (A&D), Gayle Allard (Business), and Soledad Atienza (Law). They celebrated together the challenges we have overcome and the positive legacy we want to leave behind. 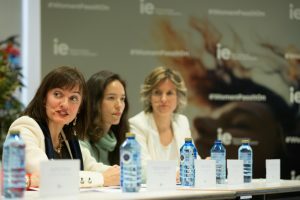 During the Alumni Panel ‘Inspiring Women’, Julia Sánchez, Head of IE Global Alumni Relations, introduced EPIC, Extraordinary People Inspiring the IE Community. Followed by an interview with Fernando Barnuevo, President of IE Alumni Association, and Veronica Pascual, IE alumna of the AMP 2007 and EXMPLS 2015. CEO of Asti, Veronica shared with us the details of one of the projects she is leading, STEM Talent Girl, a mentoring project designed to ensure the development of women in Science, Technology, Engineering and Mathematics. In the Networking Lunch – IE Community, the Value of Mentoring, we celebrated more than 10 years of the IE Women Mentoring Program. 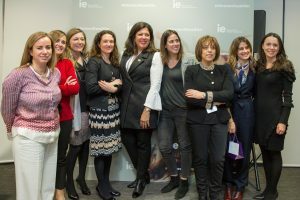 Powered by IE Business Development Spain and Celia de Anca, Director of IE Center for Diversity, the event was conducted by Juan José Güemes, VP of Economic Affairs and Chairman of IE Entrepreneurship and Innovation Center, and Mar Hurtado de Mendoza, Head of IE International Development. Empowering Women in the Corporate World was a really interesting round table with great executives from our partner companies: Malek Nejjai, Chief Diversity Officer, Amadeus IT Group; María de Santos Galíndez, Head of Talent and Culture, CEPSA; Itziar Vizcaíno, Director of Human Resources, Metlife; Diana Robino, Senior Vice President, Business Development, Master Card; Constanza Vergara, Partner, Pérez-Llorca; Elena García -Olías Jiménez, Senior HR Business Partner, Oracle Spain; Carolina Ferrer, Adjunct Professor at IE University and Gender Equality Consultant, World Bank Group; and Mireia Marrón, Director of Professional Development and Recruiting, McKinsey&Company. We discovered the strategies they are implementing for women professionals. The IE WIB Club Cocktail by Mastercard took place at the Warehouse with star speakers from our Women in Business Club Dinner Series.